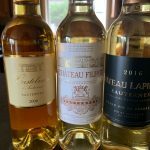 Go Golden Bordeaux Virtual Tasting - Write for Wine: It's Wine O'Clock Somewhere!Write for Wine: It's Wine O'Clock Somewhere! Not surprisingly, these sweet wines are sometimes called late harvest wines. Harvests in the Bordeaux region traditionally take place in September. But the grapes for sweet wines are harvested one-to-two months later, when they reach peak ripeness. With misty mornings and dry, sunny afternoons, moisture is trapped in the grape and then evaporates. Slowly dehydrating over time, the grapes develop Botrytis Cinerea or “Noble Rot,” a fungus also found in Stilton blue cheese and penicillin. In grapes, Noble Rot concentrates the sugar content, intensifying the sweetness level and adding flavor. 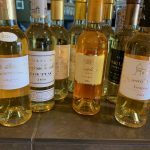 Often called Golden Bordeaux, these sweet wines are typically made with a combination of Sémillon, Sauvignon, and Muscadelle grapes. As pictured, their colors range from light orange to gold to straw yellow. Many tasters think sweet wines should be enjoyed with salty, spicy and savory dishes. But others prefer soft cheeses such as brie, triple cream or creamy blue. We enjoyed them with salty crackers and creamy cheeses. These tasting notes, part 1 and 2, reflect our comments, along with some from our colleagues at the virtual tasting, and our friends Jenise and Bob Stone, who enjoyed the wines with us. This blend of Sémillon (98%), Muscadelle and Sauvignon Blanc (1% each) is young, fresh and zesty, particularly as the first pour of the tasting. Citrus, mango, papaya, apricot and honey flavors lead into a long finish. Sémillon (90%) is topped off with Sauvignon Blanc (10%), creating an easy-drinking wine that seems extra fresh because of the Sauvignon Blanc. Bright, with golden reflections, it shows lots of fruit and freshness, with great cellaring potential. Another golden Bordeaux, this 100% Sémillon opens with a delicate bouquet, followed by flavors of ripe peach, spice, honey and jasmine. In addition, the Château La Rame is distinguished by its minerality. Another blend of Sémillon (90%), Muscadelle and Sauvignon Blanc (5% each), this pretty wine is clear in color, with an intense nose and flavors of citrus, candied fruits, pineapple, lemon, orange and guava. According to this chateau’s winemaker, 2011 was a miraculous vintage for sweet wine. A combination of Sémillon (80%) and Sauvignon Blanc (20%) results in an Intense, fruity, pretty nose, with flavors of stone fruit, pine nut, honey, caramel, tangerine, candied fruits and savory notes of mushroom. We preferred this Sauternes after it opened up for a couple of hours. With 100% Sémillon, the palate experiences savory notes that balance with the sweet flavors of stone fruit, citrus and spices. The Château FILHOT is a classic, fresh Sauternes with 60% Sémillon, 36% Sauvignon Blanc and 4% Muscadelle. The larger percentage of Sauvignon Blanc brings grassy notes to FILHOT, while reducing the intensity and sweetness of the other wines we tasted. This golden Bordeaux definitely has the wow factor, with its age deepening the golden color to a pretty, rich orange. Again, the blend is Sémillon (90%) and Sauvignon Blanc (10%), featuring a beautifully integrated sweetness. With fruity aromas and flavors of peach, apricots, orange marmalade, honey, vanilla, spice and wood, the finish reveals burnt hints from the oak, mingling with peach and caramel. This wine was our personal favorite. As mentioned, Golden Bordeaux wines pair well with soft cheeses such as blue, brie, camembert and triple-creme. But they also are complemented by savory dishes such as truffle fries, bacon, fried or roasted chicken, oysters and mushrooms. Mary Gordon McAdams also suggested a BLT sandwich for variety. In addition, the sweetness can be offset by spicy dishes or salty foods. To experience the best flavors, Mary also recommends these wines be tasted in a white wine glass, or a universal glass, rather than a flute or sherry glass. Thank you Snooth and Mary for introducing us to these sweet wines of Bordeaux. This entry was posted in Bordeaux Blend, France, Sauvignon Blanc, Sémillon, Wine and tagged Bordeaux blend, Castelnau de Suduiraut, Chateau Dauphine Rondillon, Chateau du Cros Loupiac, Chateau FILHOT, Chateau La Rame Saint Croix du Mont, Chateau Lapinesse, chateau Loupiac-Gaudiet, Chateau Manos, Golden Bordeaux, Late Harvest wine, Muscadelle, Sauv Blanc, Sauvignon Blanc, Semillon, Snooth by Margot. Bookmark the permalink.